The waterfront dispute of 1951 was the biggest industrial confrontation in New Zealand’s history. Although it was not as violent as the Great Strike of 1913, it lasted longer – for five months, from February to July – and involved more workers. At its peak, 22,000 waterside workers (‘wharfies’) and other unionists were off the job. Sid Holland’s National government declared a state of emergency on 21 February, warning the following day that New Zealand was ‘at war’. 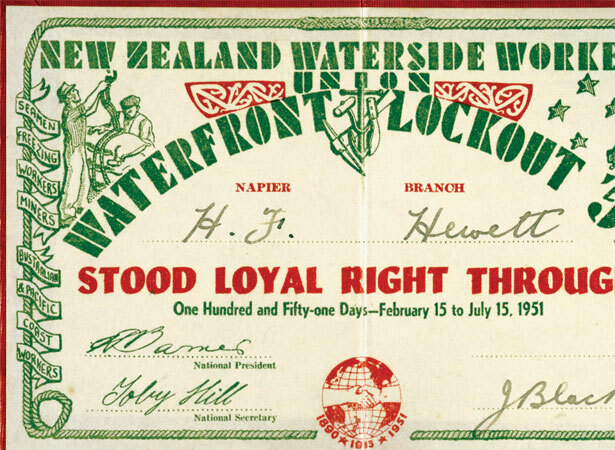 On the 27th, troops were sent onto the Auckland and Wellington wharves to load and unload ships. Emergency regulations imposed strict censorship, gave police sweeping powers of search and arrest, and made it an offence for citizens to assist strikers – even giving food to their children was outlawed. As the dispute dragged on through autumn and winter, there were sporadic outbursts of violence. By the end of May, with new unions of strike-breakers (denounced by unionists as ‘scabs’) registered in the main ports, the wharfies’ position became increasingly hopeless. They conceded defeat on 15 July. We have 3 biographies, 4 articles, related to Troops deployed in waterfront dispute .